Adorned with beautifully multi tonal Swarovski® crystal, this elegant cluster heart will add a touch of sparkle to your collection. Discover all the ways to express yourself with one of a kind jewellery that reflects your life and experience. Inspired by your personal sense of style, Chamilia jewellery is as unique as you are. 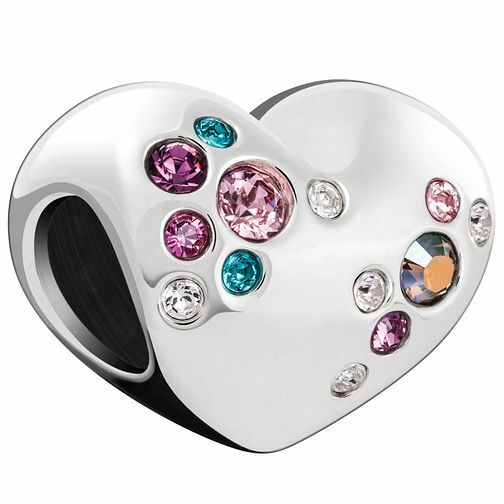 Chamilia Crystal Cluster Heart Charm with Swarovski Crystal is rated 3.8 out of 5 by 4. Rated 1 out of 5 by Anonymous from Looks lovely new When I got this I thought how lovely it was, then one by one all stones fell out. Would of been perfect only for this.